Here's how one company's consultants used COM+ and MTS to scale its Oracle database to be available via the Web. Active Server Pages to handle the front end, rendering browser-neutral HTML for the client. Visual Basic to write an object-oriented middle-tier built of COM components that we placed in a COM+ package. Oracle 8i for the database server on the back end (see figure 1). We knew there were plans to add data sources, including Microsoft SQL Server and possibly Microsoft Exchange. This is where our challenge began-we needed to integrate transactions across platforms. We had to decide how to control the database transactions. The easiest approach is to allow Oracle to manage them. This support is built into every client/server database. While this would work for the first phases of the project, once a disparate data source like SQL Server or Exchange is added, we would need to modify the code. We didn't want to be tied to maintaining all the data within Oracle. Microsoft developed the Distributed Transaction Coordinator (DTC) for managing transactions across databases. It uses a two-phase commit system: Each database does a trial execution of the transaction, but does not commit the transaction. 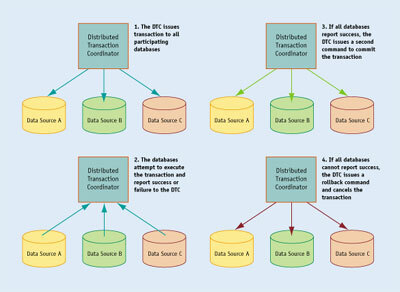 If all databases report that the transaction is successful, the DTC then informs all the databases to commit. If any databases report back errors or fail to report back at all, the DTC issues a rollback to all participating databases. If the DTC fails or if network communications are lost, each database automatically rolls back the uncommitted transactions (see figure 2). This assures that all the databases either commit or rollback the transaction together (see "What's a Transaction?"). To simplify use of the DTC, Microsoft built the Microsoft Transaction Services (MTS). It allows COM-based components to use the DTC automatically for coordinating database transactions. This service grew into COM+. With minor changes to code, software components can execute database changes and participate in distributed transactions. When two changes need to occur simultaneously within a database, they become a transaction. An example of a transaction is simple: when you purchase something you must pay for it. The exchange of goods for money is a transaction. There are many needs for transaction within databases. For instance, if you move inventory from one location to another, you require a transaction. If one record gets changes, you will either end up losing the items, or they will be counted double. To know when you need a transaction, or whether you can support transactions, you need to apply the ACID test to the transaction. Atomic - The changes in the database are dependent on one another and must be executed together. For example, a transfer of funds must lower the source account balance AND increase the destination account balance. Consistent - The transaction must always leave the database in a consistent state. Either all the rows updated or none did. For example, if items appear on a bill of lading, they cannot still be listed as in-stock inventory (that would be inconsistent). Isolated - When one user is modifying records within a transaction, no one else can. For example, if three users all attempt to sell the last 4 items in inventory, only the first person can modify the records. The other users will not be able to see the inventory until the modification is complete and the inventory adjusted to 0. Durable - The system must assure that failures in networks, hard drives and other system outages do not allow the system to process a partially completed transaction. For instance, if the server unexpectedly loses power, it will rollback the partially committed rows and returns the database to a consistent state. For a database to participate in these types of transactions, it must support two-phase commits. The X/Open consortium developed the XA protocol as a standard for two-phase commit transactional support. Most client/server databases support XA protocol, including Oracle. As an option, however, Oracle also provides a service that allows the database to act as a resource manager for the MTS service. The service consists of two components. One is a proxy that operates as a service for the Windows operating system. The other is a client library that instantiates as a client-side dynamic link library. To use this service, you must use the ORACLE OLE DB provider. Oracle reports that Oracle for MTS provides "superior performance and reliability". This solution would allow us to develop in all APIs, including Oracle Objects for OLE (OO4O) and the Oracle Call Interface (OCI). These interfaces are provided by Oracle to allow developers to speak efficiently to their database. ODBC for Oracle (provided with the Oracle client software) is a translation layer that converts standard ODBC calls to OCI calls under the covers. We examined this option more closely, but based on several proof of concepts using the ODBC for Oracle driver with Visual Basic, we decided not to pursue it. Instead, we chose Oracle's XA support controlled by the DTC directly. The choice eliminated Oracle as a single point of failure for the application, and also allowed us to use the Microsoft OLE DB provider for Oracle services within the Visual Basic components. The first step is to configure the XA support on the server with your database administrator. XAVIEW.SQL creates the V$XATRANS$ view. The script can be found in the [Oracle Home]rdbms/admin directory. The SYS user must run the script. After running the script, the DBA must grant SELECT on the DBA_PENDING_TRANSACTION view to the public. We tested the XA support configuration using the Oracle test program (TestOracleXAConfig.exe). We confirmed the test using a program from Microsoft Windows 2000 SDK, Msdtcora.exe. Balance I/O across disks. Transactions require increased disks reads and writes. Next, we had to configure our client software. We chose the Oracle 8.1.6 client software with the latest patches downloaded from Oracle. This must be installed on the middle-tier application server, because the application server instantiates the components that communicate with the database. Once the software was installed, we needed to make some manual corrections to the registry on the application server. We set the following values on the keys found in the HKEY_LOCAL_MACHINE\SOFTWARE\Microsoft\MTDTC\MTxOCI hive. It's important to assure the proper client software is installed and it is used in the proper order. Several of the development machines had multiple Oracle homes (multiple copies of the client software installed). We discovered we could control the client software used by placing the proper components in the correct order in the Path statement in the Environmental variables. On the production application server, we performed a clean installation to assure no older copies of the client software or DLLs were located on the machine. Once we were properly configured, we were prepared to utilize the COM+ transactions. Transactions must be used carefully. A transaction's isolation level determines how and when other resources can access the data it locks. By default the isolation level used by COM+ is serializable. This ensures the highest protection against concurrency, but at a price of lower throughput. Once a record becomes part of a transaction, other users cannot access it until the transaction is committed or rolled back. These records remain isolated until the entire two-phase commit process is completed. It's also important to commit these transactions quickly, so we performed all the necessary steps before starting the transaction. 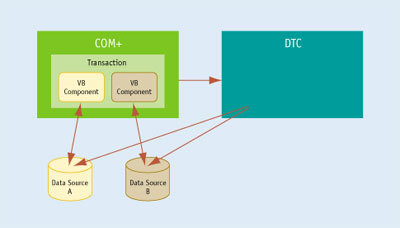 The VB components are called into a transaction together. COM+ informs the distributed transaction coordinator of the pending transaction. 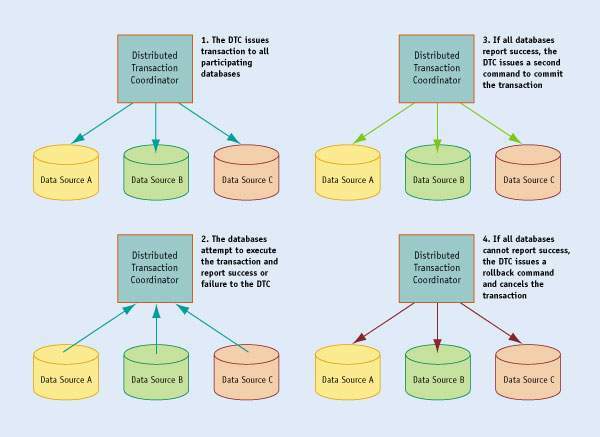 The DTC enlists the databases in the transaction. 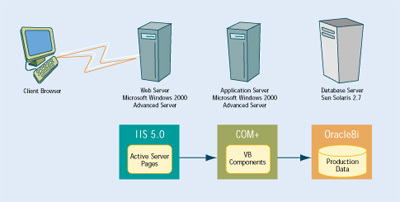 The VB components execute the changes within the databases. If they receive no errors, they send a "SetComplete" to COM+. It informs the DTC of each vote. If all components report a "SetComplete", the DTC sends a commit to the databases. If any of the VB components encounters an error, it sends a "Set Abort" to COM+. COM+ passes the "SetAbort" to the DTC. The DTC sends a rollback command to all databases enlisted in the transaction. Carefully plan what does and does not require a transaction. Changes that are not related or dependent on one another do not need to be joined together in a transaction. Rows that are read but not modified should not be included in transactions, either. Multiple small transactions are typically more efficient than a single, long running transaction. And never pause in the middle of an open transaction to wait for user input or process information. Gather and process all data before beginning the transaction and modifying the tables whenever possible. COM+ allows components to participate or abstain from participating in transactions. We planned the components so the ones that required transactions could be participate in them. The components that performed single table updates also did not need to participate. By minimizing distributed transactions, we optimized database performance. One particularly nice feature we leveraged from Oracle is autonomous transactions. When an error is encountered during a transaction, all data modifications are automatically rolled out of the database. That would normally mean we could not log errors in the database itself. By using autonomous transactions, we could separate error-logging inserts from the rest of the transaction and record any errors that occurred in an exception table. Our error returns provide the row identifier to indicate which row in the exception table contained the error. Want to know more about the Oracle certification program? Start at http://CertCities.com and click on Oracle in the "Certification Communities:" quick search bar. By carefully planning our transaction strategy, we were able to architect a solution that optimized database performance. By carefully installing and configuring the correct components, we were also able to deliver a robust, scalable solution that would meet future needs as our client scaled up.